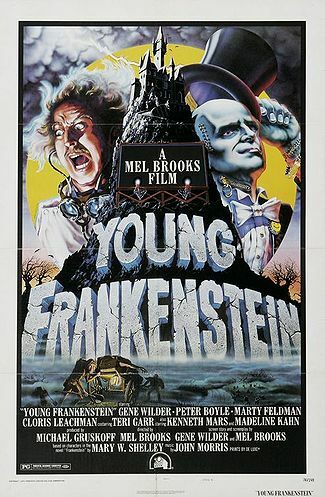 Being big fans of Re-Animator, about which noted critic Pauline Kael said, “the bloodier it gets, the funnier it is,” we thought we’d take another look at this re-animator, the funny Young Frankenstein (which she happened to mention in the same breath in her review). 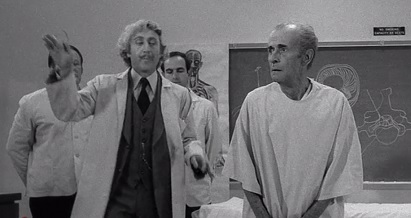 Here Dr. Frankenstein (played by Gene Wilder and pronounced Fronk-en-steen) is a Lancet-reading med school instructor and reluctant and embarrassed descendant of the infamous doc. He’s on a trip to Transylvania. There, at the foreboding mountaintop castle he decides to resume his grandpa’s experiments, re-animating the dead with the help of hunch-backed and oblivious to said condition, the ineffectual assistant Igor (eye-gore). There’s musty books, dusty passageways, creaky doors, winding staircases, candle-lit corridors and a hodgepodge of cobwebs, all hallmarks of the 1930s Universal Pictures Frankenstein movies and lovingly rendered in rich black & white by legendary gag-man, director Mel Brooks. And of course, there’s a giant machine with electrical coils, complete with a variety of mysterious levers. The doc finds his grandfather’s private library, a revelation met with a glorious lightning strike. He then gets down to business of bringing the dead back to life, in this case a being 7-feet in height, stolen from the local graveyard, into whose cranium he implants the brain of one “saint and scientist” Hans Delbrück. Terri Gar is terrific as Inga, who substitutes “Ws” for “Vs,” and Cloris Leachman delights as Frau Blücher. But it’s Mary Feldman as Igor who really steals the show in a baroque bug-eyed comic turn. Horror has gone from cautionary tales about scientists discovering the “the secrets of bestowing life” here, to the dead coming back to life through external forces (radioactive contamination, viruses, and whatever the latest zombie film iteration is).What’s endlessly fascinating about horror though is that it reflects cultural anxieties of a particular age. The original zombie films were grounded in xenophobic fears of foreign religious customs such as Haitian folklore/practices), while the 1950s took as their influence fears over the proliferation of nuclear weapons. And filmmakers like Stuart Gordon and Mel Brooks revived older fear traditions, giving them a new spin for new generations, familiar with the older traditions of horror via the medium of television. This entry was posted in Black comedy and tagged 70s movies, Comedy horror, monster movies by Really Awful Movies. Bookmark the permalink. I love watching this movie. It’s a great spoof on a part of the horror franchise.